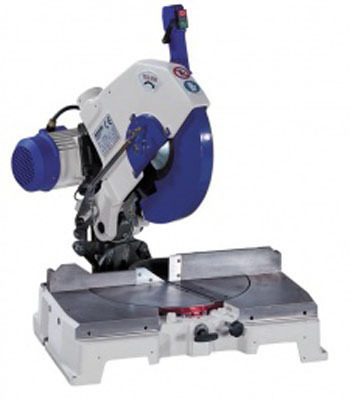 Heavy duty and flexible are the two main features of this Compound Precision Mitre Chop Saw. Positive stops at 45, 30, 22 1/2, 15 and 10 degrees on both sides of the rotation and an independently fine tunable one at 90 degrees. A manual locking device for all the intermediate angles provides a great flexibility to this unit. The unit is also equipped with a 45 degree positive stop for precision beveling. The belt driven transmission and a powerful 4 HP induction motor make the T 53 370 the ideal tool for heavy duty industrial usage. This machine is designed to be fitted with a wide variety of optional accessories to make it perfect for any application. This precision saw is a multi-purpose machine suitable for use in general carpentry, for cutting crown moulding, picture frames, furniture components and any application requiring precision cutting. Cross Cut Capacity 90 Deg. Cross Cut Capacity 45 Deg. 25 5/8 X 20 1/8"
28" x 28" x 33"